Heat 12-inch nonstick skillet over medium-high heat. Cook shrimp in skillet 2 to 4 minutes, stirring occasionally, until pink and firm. Remove shrimp from skillet; keep warm. Heat water to boiling in same skillet. Break up noodles from soup mix into water; stir until slightly softened. Stir in vegetables. Boil noodles and vegetables 4 to 6 minutes, stirring occasionally, until vegetables are crisp-tender. Stir in seasoning packet from soup mix and stir-fry sauce. Cook 3 to 5 minutes, stirring frequently, until hot. Stir in shrimp. Transfer mixture to a serving platter or individual platters and garnish with toasted almonds and chopped cilantro. You wouldn't think of ramen noodles as typical Betty Crocker territory, but the editors at BC HQ say they get requests for recipes employing these skinny packaged noodles all the time. 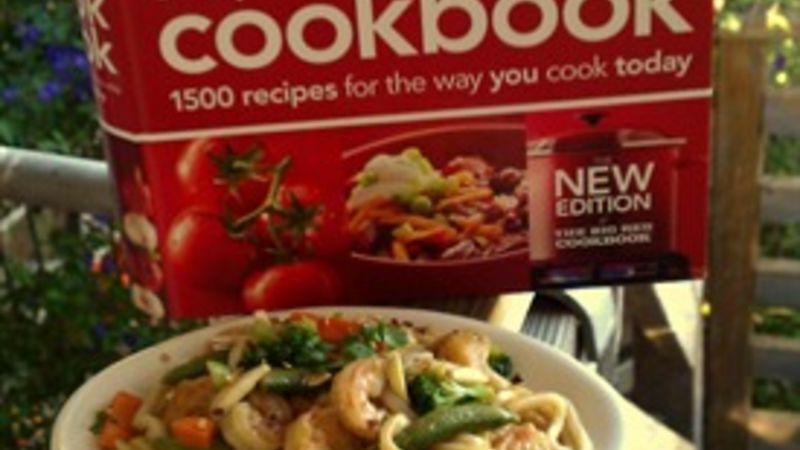 The standard that has made it into the Betty Crocker cookbook is a combo of ramen, shrimp and typical Asian stir-fry vegetables. I think if you're going with packaged noodles, then thick, chewy Japanese udon make a great alternative to common ramen. I used them in my Betty twist, which is now a pot-luck favorite: udon noodles with shrimp and vegetables, plus almonds for a nice crunch. You can buy the noodles in the 7.5-ounce soup mix packages, complete with a foil packet of flavorful broth base, which is invaluable in creating this dish’s rich, savory sauce. Also feel free to experiment with different seafood and vegetable combinations here. Love broccoli? Use a 16-ounce package of frozen or fresh broccoli. Adore bok choi? It’s great here too! Scallops, crab and lobster meat also make delicious additions to or substitutions for the shrimp. The procedure is pretty straightforward (even if you're not reading the directions right off the noodle pack!). You just fry the shrimp in a deep skillet or wok for a couple minutes, then set them aside. In the same skillet, boil water and add the noodles and stir-fry veggies. When everything's crisp-tender, put the shrimp back in and garnish with almonds and cilantro. Now you have a quick and easy potluck party pleaser. Enjoy!